In a small bowl, mix the yeast in ¼ c lukewarm water (do the baby's bottle test on your wrist) til it is creamy. In a large bowl, add olive oil to rest of water. With a wooden spoon, stir in all but ½ c of all-purpose flour. Add the yeast mixture. Cover with plastic and let rest for 20 minutes. The dough should be quite slack. Turn the dough out onto a lightly floured board. Sprinkle the salt and ¼ c flour on top. Wash and dry the mixing bowl. Then knead the dough for about 8 minutes, from time to time adding as little flour as you can (not much more than ¼ c) to keep it from sticking. The dough should still be quite slack but smooth and silky. Put dough in the clean dry bowl (it should be large enough for the dough to double - there is no need to oil the bowl). Cover bowl tightly with plastic wrap and let rise on the countertop for about one hour, or until double. Turn the dough out onto a lightly floured board. Divide the dough into two balls if making two pizzas. Cover with plastic and allow to rest for no more than 30 minutes (or not at all). 30 minutes before baking, turn on the oven to as high as it will go. (Our oven goes to about 500F.). We have a baking stone and bake one large pizza directly on the stone. Stretch and pat the dough to desired size. Put parchment paper or sprinkle cornmeal on peel before laying down shaped pizza dough. -OR- Stretch and pat the dough onto two pizza pans. I like to put corn meal on the bottom of the pan but it isn't necessary. There is enough oil in the dough that the pan does not have to be oiled. If barbecuing, after shaping the dough onto two lightly oiled pans, put the pans in the barbecue at medium heat (lid closed) until the bottoms are lightly golden - about 2 minutes. Remove the pans from the barbecue and flip the shells over. Dress the shells with your favourite toppings (try tomato sauce, basil, thinly sliced chorizo, thinly sliced onion, mushrooms, capers, chopped spinach and mozzarella). Then put the pans back into the barbecue (lid closed) at medium heat until the cheese is bubbling - about 4 minutes. In 2007, we bought an inexpensive pizza stone to use on the barbecue... it fits perfectly on the bottom rack (click on image to see photos of barbecuing pizza). Instead of pre-baking the dough, you can dress the shaped uncooked pizza dough. Use a peel to move the shaped and dressed pizza onto the preheated stone. Parchment paper under the pizza makes it easier to move. The parchment paper can go onto the hot stone. While dressing the pizza, put the stone into the barbecue and turn it on high. Once the pizza is dressed, transfer it to the hot stone (include the parchment paper). Close the lid of the barbecue and allow the pizza to cook for about 5 minutes. Part way through the cooking, use the peel to turn the pizza around to allow for uneven heat in the barbecue. (The parchment paper can be pulled out at the same time.) It's ready in no time! Use the peel again to transfer the pizza to the table for slicing. to blog from OUR kitchen: spinach pizza (ARF/5-A-Day Tuesday) | pizza stone rocks! | pizza party! We often add spinach to "the works" as well. Spread some tomato sauce and little olive oil evenly. Sprinkle with dry crushed oregano and basil leaves and a little grated parmesan. 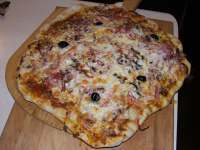 Add mozzarella, pepperoni, some dry black olives, not too many slices of roasted red pepper, a few sundried tomatoes, a few capers, and thinly sliced onion. Sprinkle a little more mozzarella on top. Bake on second to bottom shelf of oven at 400F for 20 - 25 minutes until the crust is golden and crisp and the cheese is bubbling. Serve with Eggplant Pepper Antipasto Sauce if you are really feeling decadent. blog from OUR kitchen - pizza stone rocks! Heat some olive oil in a skillet. Throw in the onions and caramelize them. Set aside. Steam the spinach until it is just limp. Plunge into cold water and squeeze out as much water from the spinach that you can. Chop coarsely. Set aside. Spread the onion mixture evenly over the pizza. Sprinkle the spinach, red pepper, pecans and asiago or goat cheese evenly over the onion mix. Edit August 2008: There is nothing so wonderful as spinach on pizza. But it can't be watery! To prevent that from happening, we use a method of preparing spinach that I saw in SAVEUR magazine some years ago. It's simple. It doesn't require pre-cooking. All you do is wash the spinach well - include decent looking stems too. Put the washed spinach in a colander and sprinkle it well with salt. The salt will do the cooking. I'm guessing that I use around a tablespoon of salt for a big bunch of spinach leaves. Toss the leaves to spread the salt around and then allow the spinach to rest and drain for about 30 minutes- more or less. When you return to the spinach, you�ll see that it�s quite limp. Squeeze it out. Hard. Rinse, taste for salt and squeeze again. Hard. You'll be left with the most wonderful emerald green spinach balls. Chop these coarsely to put on the pizza as you assemble it. The green stays wonderfully green and the spinach taste is lovely and fresh. No over-stewed flavour. We often add spinach to "the works". Spread a liberal amount of pesto evenly over the pizza. Place the goat's cheese (we use a softish chevre), roasted red pepper, garlic cloves and onion evenly over the pesto.